In cooperation with "LBM Lichtleit-Fasertechnik GmbH" we developed textiles, which give you a completely light "vision" in rooms. Light emitting textiles are semi-transparent products of light emitting- and textile fibres, which can be handled like normal curtain fabric or be used as a textile wallpaper. A projector feeds white or coloured light to the textile by way of light transmitting fibres. 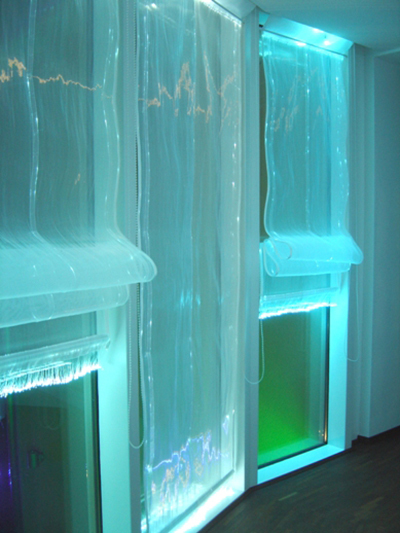 Light emitting textiles demonstrate completely new options in lighting rooms, as decorative draping or as wallpaper. 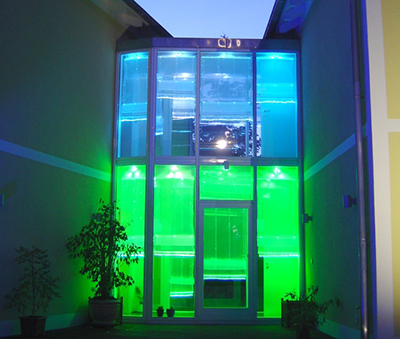 There are no limits to diversity.You can receive the complete system at www.lbm-efo.com, product name "Lichttextil".